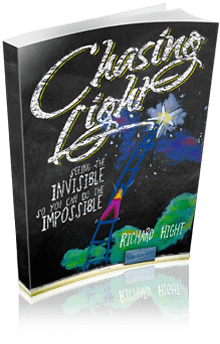 In “Chasing Light,” Richard Hight shares his story and tells of creative, innovative people who have impacted the world—their challenges, their triumphs, and their inner struggles. Filled with wisdom and insight, and a spark of refreshing humor, this book is a road map for those who want to scout the uncharted region of breakthrough and victory. The explorer on this expedition will find that helpful road signs are posted all along the way.